I have always loved the book Rainbow Fish﻿ (though I know some people don't) - not only is it sparkly, with a beautiful fish for a main character - even though he is rather conceited in the beginning. I have always found that if told the right way it can help teach children about the importance of sharing, thinking about others and being a good friend. It really is all in the telling and what you decide to focus on. I know there has been much debate on the fact that some think it actually has a poor message about buying one's friends, etc but personally, I am always suprised at how people either love or hate this book. I look at it from the view point of the child and frankly they always seem to find it mesmerizing and quite engaging. As a parent and an educator - every time I have read this book to children it has generated wonderful discussion on being selfish, not being a good friend, etc. The Lil Divas and I had a wonderful talk about being mean, not caring about others feelings and not being a good friend/sister. It was fabulous. 2. 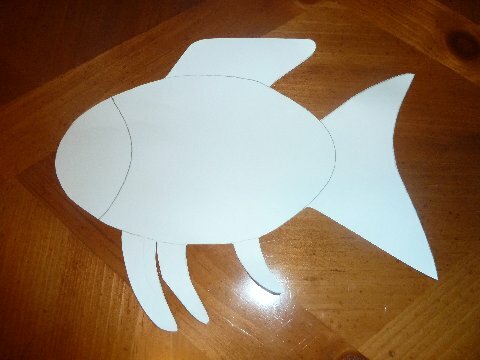 I also cut out tissue paper pieces for the tail, face and fins (I simply traced over the template) and the Lil Divas glued them on in the appropriate places. 3. 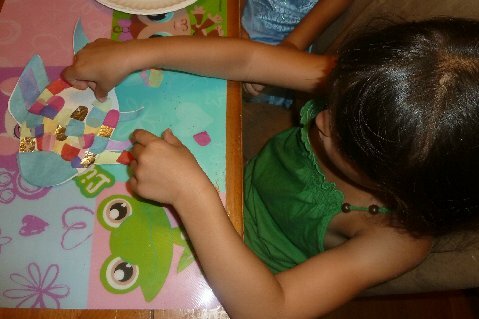 I pre-cut various colored tissue paper scales and the Lil Divas glued them on - varying the colors throughout and adding a few foil scales here and there. I encouraged overlapping so that the fish was completely covered in tissue paper scales. 4. We added a few foil strips here and there for a more glittery/sparkly effect. 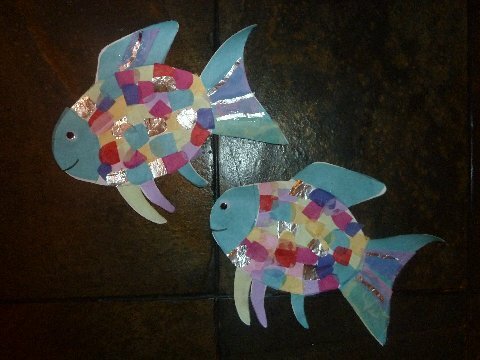 The Lil Divas opted to make Rainbow Fish before he gave his scales away. You can also only use 1 foil scale to make the other version. 5. Add a wiggly eye (or draw one) and draw a mouth/smile using black marker and voila - you have a stunning Rainbow Fish! 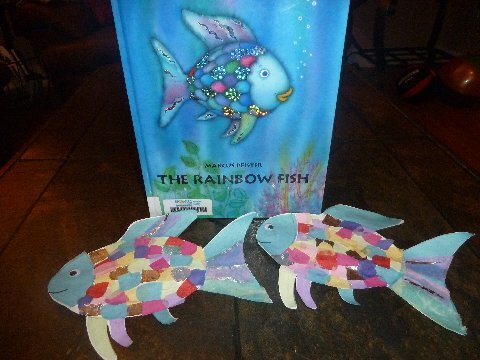 What is your take on the book Rainbow Fish? I am always curious to hear what other's think about this book! LOVE LOVE LOVE this book!! I love this book, and I know my girls would love to do this craft, too. Those fish are just gorgeous and we love that book too! This is a great book. I'm bookmarking this for a fun project! This is a favorite book of ours! Great activity - thank for sharing! I have to agree, I love Rainbow Fish! This was always one of my favorite activities to do when I taught. The book teaches such a good lesson and I always loved using the fish (ours were similar but not exactly the same) for a colorful, beautiful bulletin board! Hi there: I am a new follower popping by from Classified Mom and the Wednesday Bloghop. These are cute crafts. Thanks. It's scary how much we are in sync! Great fishies! 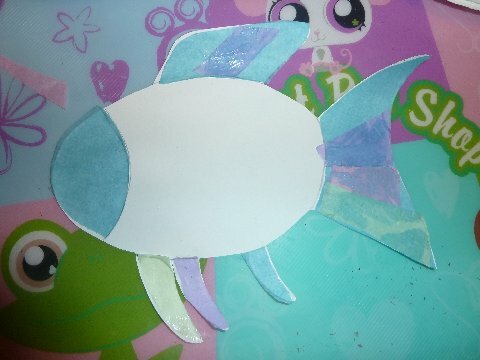 Like the rainbow fish craft. Will use this summer with my grandsons! I have mixed feelings myself about the book, but my son has always loved it. I do try to be careful how we talk about him giving the fins away (emphasizing treating people kindly, trying to minimize the potentially materialistic component). However, I love this craft! So cute! I'll have to save this idea for our ocean theme next month. Thanks for the invite here to link up! Cute craft again. I love all the fun you do with books with your girls. So wonderful! My kids and I love the Rainbow Fish too. I'm surprised that some people don't! It has provided us a valuable opportunity to discuss pride, selfishness, community living and humility. A wonderful read. And I love your craft activity! Will try it someday. We love the Rainbow fish too! I was surprised at the negative reviews. Actually the Rainbow fish does have a single shiny scale for himself and shares all others so everyone has one. We think it is a good way of sharing. We made a Koinobori flag based on Rainbow fish.